These whole food bites are a sweet and satisfying “AA” treat. 2 Tbsp flax meal, almond flour or oat flour (possibly more or none at all depending on how runny or thick the honey you used is. Wait and see. In a medium large mixing bowl combine the almond and peanut butter, oatmeal and raw honey. Stir together well. Add the coconut and diced pecans or sesame seeds and mix together. If the thickness is right for forming into balls add the chocolate chips and you're ready to go. If it is too sticky add the flax meal, almond flour or oat flour a Tbsp at a time until the mixture is just right. Then add in the chocolate chips if using. 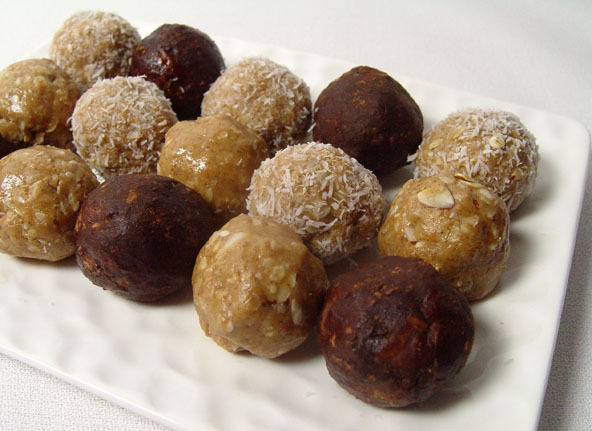 Roll into 1 or 1½" balls and then roll the balls in either coconut, carob or cacao powder, or diced pecans or just make it easy and keep em' plain. They are now ready to serve. Keep them cool in the refrigerator if the weather is warm. You can easily grind flax seeds in a small coffee grinder (not used for coffee) or a bullet blender as well as almonds and oat groats or rolled oats to quickly blend into a flour. The extra small blenders work better than the larger Vita Mix or Blentec blenders for blending small amounts. Vegans can use dates or raisins, soaked for 30 plus minutes, drained and pureed in a very small blender adding 1 Tbsp water at a time as needed to resemble thick honey. Maple syrup can also be used but it will definitely take flax meal, almond or oat flour to thicken it up sufficiently.